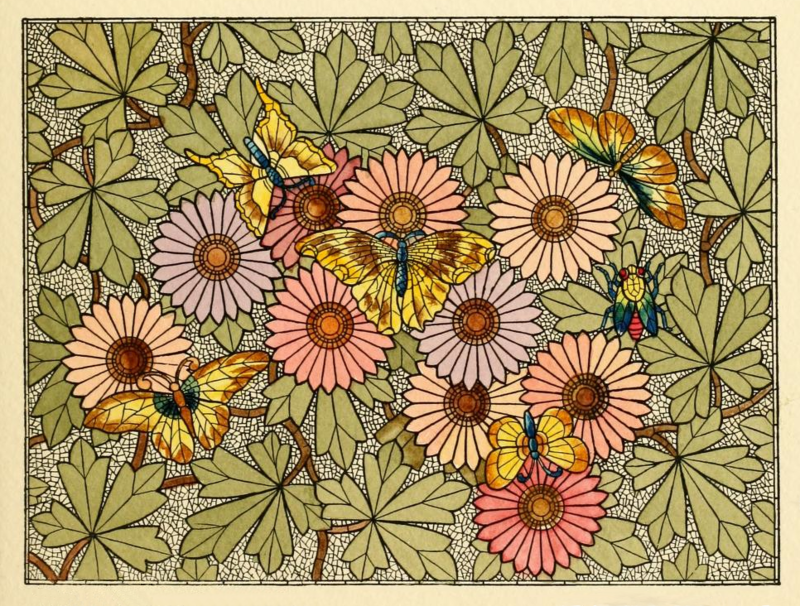 A colorful catalog from 1886 included this pretty butterflies and flowers mosaic. The Belcher Mosaic Glass Co. was apparently a fairly large company – considering they published a large-full-color catalog that included pieces like this one. Four yellow, blue and brown butterflies check out the lavender, salmon and peach flowers. Also visiting the green leaves and bright flowers is a brightly colored fly in yellow blue and red. Teeny pieces of white glass would have been placed between each of the 5-petaled leaves, the flowers and the insects. In real life, this piece must have been stunning. 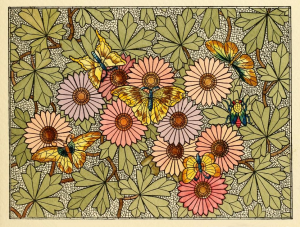 Even as a vintage drawing, this butterflies and flowers mosaic is quite lovely. I’ve shared a slightly smaller version of the vintage butterfly and flowers drawing here. You can view and download a larger version by clicking on it.